You will find many practice questions (with solution) on thermodynamics on this site. You can access them by clicking on the label ‘thermodynamics’ below this post. Today we shall discuss a few more multiple choice practice questions in this section for the benefit of AP Physics B aspirants. If the temperature increase occurs at constant volume, the entire energy supplied to the gas is used up in increasing the internal energy of the gas. The energy required for increasing the temperature of one kilogram of the gas through 1º C at constant volume is the specific heat of the gas at constant volume (Cv). When the temperature increase occurs at constant pressure, the gas has to expand and therefore has to do external work. The specific heat of the gas at constant pressure is equal to the energy supplied for increasing the temperature of one kilogram of the gas through 1º C at constant pressure. But the increase in the internal energy of 1 kg of the gas on heating through 1º C in this case also is Cv. Keeping the pressure constant, when the temperature of m kg of the gas is raised through ΔT º C, the total energy required is mCpΔT. Out of this the energy used in increasing the internal energy of the gas is mCvΔT. The energy spent for doing work is therefore given by the difference between the two values and is equal to m(Cp – Cv)ΔT. (3) A sample of gas contained in a cylinder undergoes a cyclic process shown by the adjoining PV diagram. Among the following statements which one is correct? During the process shown by AB the gas expands. Therefore work is done by the gas (and not on the gas). Statement (a) is therefore incorrect. 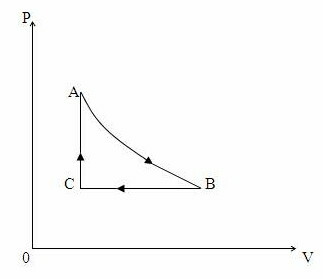 Since the cycle ABCA is clockwise, work done by the gas is positive. Statement (b) is therefore incorrect. During the process BC the volume of the gas changes and hence the process is not isochoric. During the process CA the pressure of the gas changes and hence the process is not isobaric. Work done on the gas uring the process CA is zero since CA represents an isochoric process. Therefore option (e) is correct. [Note that work is done only if volume changes]. (4) A Carnot engine operates using a high temperature source at 400 K and a low temperature sink at 300 K. How much more efficient will this engine be if the temperature of the sink is reduced to 200 K? η = (Q1 – Q2)/Q1 = (T1 – T2)/T1 where Q1 is the quantity of heat absorbed from the source at the source temperature T1 and Q2 is the quantity of heat liberated to the sink at the sink temperature T2. The engine is therefore twice as efficient [Option (a)]. The internal energy of the gas decreases when it does work on the surroundings and also when it transfers heat to the surroundings. The total decrease in the internal energy of the gas is therefore equal to 25 J + 15 J = 40 J [Option (d)]. You will find similar questions with solution here.